Marine protected areas (MPAs) are believed to be an effective means of preserving marine biodiversity. Hence, MPAs have become the cornerstone of many national and international strategies for decelerating the loss of marine biodiversity. Australia has made strong international commitments to increase its coverage of MPAs through the principles of systematic conservation planning and, in the last 10 years, has rapidly expanded its MPA coverage using these principles. This paper assesses Australia's progress in achieving a key principle of systematic conservation planning—representation—which states that MPAs will include the full range of marine ecosystems. Australia's progress in achieving representation is measured nationally and within seven extensive commonwealth marine regions: the Great Barrier Reef Marine Park (rezoned in 2004), the South East Marine Regional Plan (2007), and the South West, North West, North, Temperate East and Coral Sea proposed plans (2011). State marine waters (within 3 nautical miles of the coast) are not considered. Results illustrate that, if the proposed marine plans are followed verbatim, Australia will protect just over 36% of its marine jurisdiction in MPAs and over 13% in “no-take” marine reserves. However, except for MPAs in the Great Barrier Reef, and the proposal for the Coral Sea marine park, the existing and proposed MPAs are far from representative. Importantly, only a small portion of the highest protection occurs on the continental shelf where activities potentially harmful to marine biodiversity are concentrated. 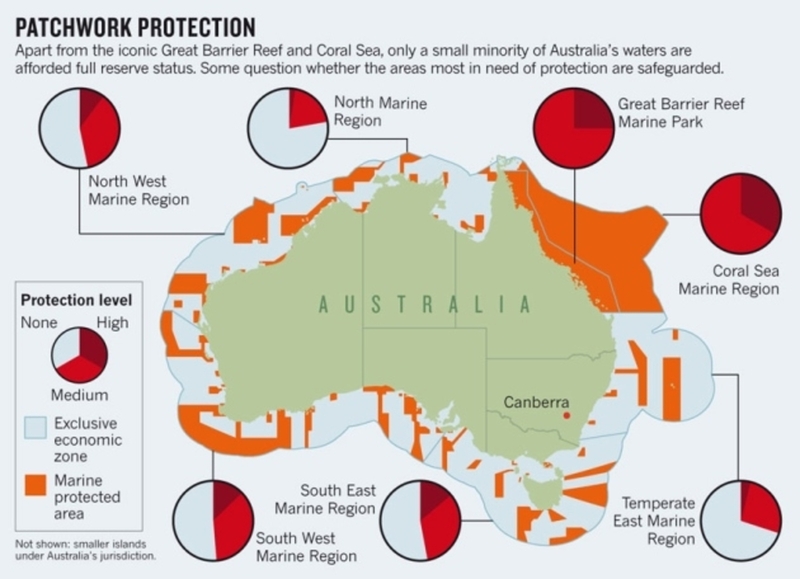 Despite having a strong and long-standing commitment to the principles of systematic conservation planning, Australia is not achieving the fundamental requirement of representation across most of its marine jurisdiction. We conclude that a failure to set quantitative targets is restricting the achievement of representative marine protection in Australia. Consequently, the 2004 rezoning of the Great Barrier Reef remains a model to emulate, not only in other countries, but in other parts of Australia's marine waters. ► The representation of Australia's newly released MPA network was analysed. ► Only a small portion of the highest protection occurs on the continental shelf. ► Australia's new marine reserves do not represent Australia's marine biodiversity.